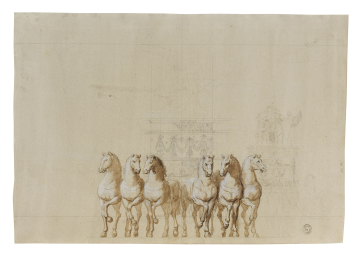 Unfinished design for a sculptural group showing part of a chariot drawn by six horses with attendant figures. Beside this is a profile of a chariot with figures and wheel. You are here: CollectionsOnline / Unfinished design for a sculptural group showing part of a chariot drawn by six horses with attendant figures. Beside this is a profile of a chariot with figures and wheel.